Feature Image Credited to WebMD. When mold, mildew, fungus, yeast, candida, parasites, bacteria, virus and other unfriendly microbes live in excess in our gut, they can live in our sinuses without us knowing it… until the possibility is revealed by our thermal imaging. But some sinus infections can be treated on contact by rotating essential oils in neti pot applications. Let’s explore the most potent essential oils for neti pot use. A microbe is defined as a microorganism (a microscopic living organism) and includes bacteria, mold, fungi, protozoa, and algae, among others. (Viruses are regarded as not living but still fall in the realm of microbiology.) Because the gut and sinus are one system, microbial infections of the gut may be found in the sinuses. While many of my clients report no symptoms or sensations in the sinuses, thermal imaging can help reveal the presence of sinus infection. While her infection originated in the gut (intestines), it is clearly systemic and thriving in her sinuses too. Yet, she felt nothing. She subsequently adopted an anti-candida diet and nutriceuticals to combat the infection. Cinnamon, clove and rosemary oils have shown antibacterial and antifungal activity (3); Tea tree (melaleuca) oil has shown antiseptic and antimicrobial, antifungal, antiviral, and antiprotozoal properties (4); Lemon and rosemary oils possess antioxidant properties (5), (6); Citronella oil has shown inhibitory effect on biodegrading and storage-contaminating fungi (7); Lavender oil has shown antibacterial and antifungal activity and found to be effective to treat burns and insect bites (8). Several studies have shown that cinnamon, clove and rosemary oils have strong and consistent inhibitory effects against various pathogens (9). And, combining certain oils can provide an additive or synergistic effect (10). 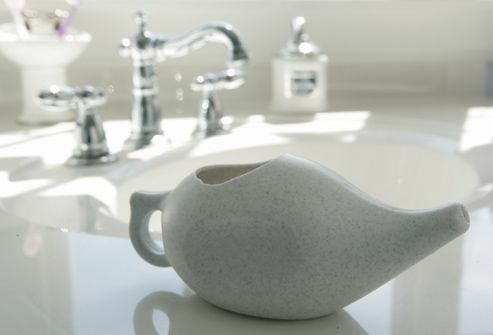 Add a few drops of essential oil in warm water in your neti pot. (Too much essential oil can burn/irritate your sinus passageways!) If you use sea salt, use ½ to 1 tsp of sea salt per two cups of warm water. With your head over a sink or in the shower, lean forward slightly so your head is nearly horizontal, turning your head to one side. Insert the neti pot spout snuggly into the upper nostril allowing its solution to flow through your sinuses and out the lower nostril. Be sure to keep your mouth open and breathe through your mouth: relax. Use half the solution in the first nostril and the remainder in the second. In between and/or after each flush, you can gently blow your nose to clear the solution. I put a fingertip on one nostril and gently blow into the sink, and then repeat for the other nostril. Apply once or twice a day, perhaps morning and night, and after any excess exposure to allergens or foreign materials, i.e. after mowing the lawn. Consider rotating the essential oils from day to day to order to gain a broader spectrum of antimicrobial effect, and including sea salt in the rotation. Have you heard of Young Living Essential oils? The Thieves Blend includes Clove bud oil, Lemon peel oil, Cinnamon bark oil, Eucalyptus leaf oil, and Rosemary leaf oil. To find a provider in your area, you can Google: “young living products near [city], Colorado” and distributors will be listed for you. (Some chiropractic offices that carry nutraceuticals carry Young Living products as well.) Find it at our host’s office in Boulder at: www.drfinegan.com and at 303-447-2737. See the Preventive Support library. 1Hammer K, Carson C, Riley T: Antimicrobial activity of essential oils and other plant extracts. J. Appl. Microbiol. 1999, 86:985–990. 2Kalemba D, Kunicka A: Antibacterial and antifungal properties of essential oils. Curr Med Chem May 2003, 10 (10): 813–29. 3Ouattara B, Simard RE, Holley RA, Pitte GJP, Begin A: Antibacterial activity of selected fatty acids and essential oils against six meat spoilage organisms. Inter J Food Microbiol 1997, 37:155-162. 4C. F. Carson, K. A. Hammer and T. V. Riley; Melaleuca alternifolia (Tea Tree) Oil: a Review of Antimicrobial and Other Medicinal Properties. Clin Microbiol Rev. 2006 Jan, 19(1): 50–62. 5Calabrese V, Randazzo SD, Catalano C, Rizza V: Biochemical studies on a novel antioxidant from lemon oil and its biotechnological application in cosmetic dermatology. Drugs Exp Clin Res 1999, 25:219-225. 6Aruoma OI, Spencer JP, Rossi R, Aeschbach R, Khan A, Mahmood N, Munoz A, Murcia A, Butler J, Halliwell B: An evaluation of the antioxidant and antiviral action of extracts of rosemary and Provencal herbs. Food Chem Toxicol 1996, 34:449-456. 7De Billerbeck VG, Roques CG, Bessiere JM, Fonvieille JL, Dargent R: Effects of Cymbopogon nardus. (L.) W. Watson: Essential oil on the growth and morphogenesis of Aspergillus niger. Can J Microbiol 2001, 47:9-17. 8Cavanagh HM, Wilkinson JM: Biological activities of lavender essential oil. Phytother Res 2002, 16:301-308. 9Matan N, Rimkeeree H, Mawson AJ, Chompreeda P, Haruthaithanasan V, Parker M: Antimicrobial activity of cinnamon and clove oils under modified atmosphere conditions. Int J Food Microbiol 2006, 107:180-185. 10Imaël Henri Nestor Bassolé and H. Rodolfo Juliani: Essential Oils in Combination and Their Antimicrobial Properties. Molecules 2012, 17, 3989-4006. 11Seenivasan Prabuseenivasan, Manickkam Jayakumar and Savarimuthu Ignacimuthu: In vitro antibacterial activity of some plant essential oils. MC Complementary and Alternative Medicine 2006, 6:39.